For the past few months, I've been on the lookout for the ultimate pink lip stick. One that matched my skin so beautifully that it didn't even look like I was wearing lip color. My intention was to procure the ultimate product that could enhance the look of my natural lip while creating a beautiful blush pink tone. When fall rolls around, everyone starts to break out their wine and burgundy lip shades. I have something else in mind. What if, instead of reaching for our dark rouge matte lipsticks, we try a soft pink lip for winter? I have several reasons why I believe we should trade in the opaque matte lip for a shade of soft, natural pink. Here are just a few. As temperatures drop, our skin tends to produce less oil. This means that our faces are more matte by default. Wearing a dark matte lip is a bit overkill. Instead, consider counteracting it by wearing a soft dewy lip. Fall and winter clothing tends to be heavy and most often we're wearing dark hues. Fall attire, in general, tends to have masculine elements. The soft pink lip brings a little balance. The colder it gets, the less blood flow we experience in the outer extremities. Circulation, as a whole slows down during winter, which means our lips receive less blood flow. That's why our lips get ultra dry and sometimes look a bit shriveled this time of year. 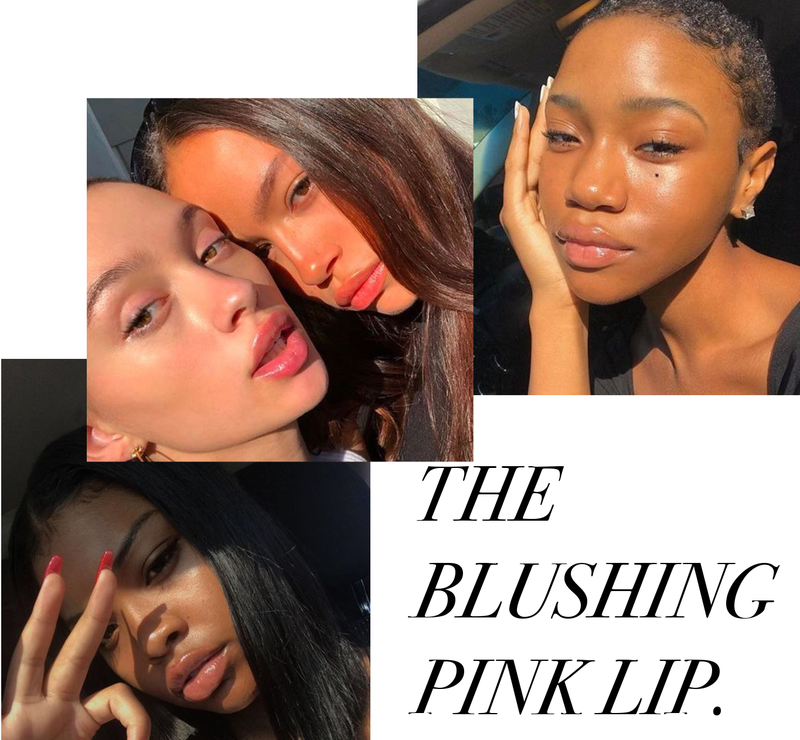 The blushing pink lip appears plump and healthy. It's supposed to simulate the look of healthy blood flow which is a sign of youth and vitality. Creating the blushing lip was a bit frustrating at first. I tried all the pink lipstick in my collection to no avail. They all looked like I was wearing pink lipstick. What I wanted to create was the look of wearing balm over soft, hydrated pink lips. The only problem was that my lips aren't naturally pink. Since my lipsticks didn't work, I went to the next best option, using pink lip pencils. They were a bit better but created too much of a matte finish. Just before I gave up on my search, I realized that a third alternative was available. The solution is the tinted lip balm. Tinted lip balms stain your lips with natural pink hues while hydrating them in the most natural way. With one swipe, you have soft, moisturized lips that appear nourished and healthy. If pink isn't your thing, you can experiment berry or perhaps you can try a sheer red lip. People won't assume that you're wearing lip color, they just think that you have naturally beautiful lips. I just so happen to have a few tinted lip balms lying around and have been wearing them faithfully the past couple of days. This morning, my husband looked at me and paid me a generous compliment on my lips. The brands I've been using so far include Body Shop's Lip Juicers, Fresh's Tinted Lip Treatment, Chapstick's Total Hydration 3-N-1 Lip Care. They're all doing their job but, since I'm obsessed with this look, I've got my eye on a few others including balms from Burt's Bees and Neutrogena. Every brand has their own level of hydration, shine, and color payoff so it helps to experiment a little. If you'd like a bit more shine, you can layer a clear gloss on top. You guys know I'm a fan of effortless beauty and the blushing pink lip is the epitome of effortless. Ideally, the end result should look like you just swiped a little balm over your already flawless lips.